The fundamentals of every sales story can be enhanced with NLP skills. From setting clear intention, to modeling excellence, to communicating clearly, NLP provides hundreds of skillsets for success. People like to know who they are doing business with! It’s a human thing. Donna has been an active Real Estate agent for over 30 years. 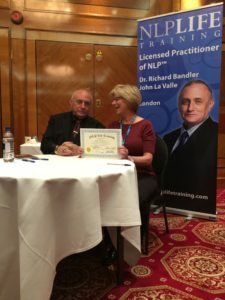 She is a licensed NLP Practitioner and has studied with the master himself, Richard Bandler. Donna has provided pro-bono business consulting and mentorship entrepreneurs in Afghanistan, Rwanda, Guatemala, and El Salvador, helping to stabilize families and communities. She is the co-author of an objection handling book, “Now What Do I Say?” and co-authored a non-profit guide for small business owners, How to manage and increase your Business to Business Sales. Donna splits her time between Pennsylvania and New Mexico, and practices the art of non verbal communication with her horse, River. Donna has coached and trained hundreds of Real Estate agents over the years in NLP techniques for success. Combined with training and certification from The Academy for Coaching Excellence, Donna provides integrative coaching for life changes, business development, and personal growth. For 7 years she has coached with Mike and Donna Stott at Yourcoachingmatters.com, providing coaching and training specifically for Real Estate agents.